Numerous invertebrates including clams, oysters, shrimp and crinoids thrived on the Sundance Sea bed. Above these bottom dwellers swam predatory squid-like Belemnites. 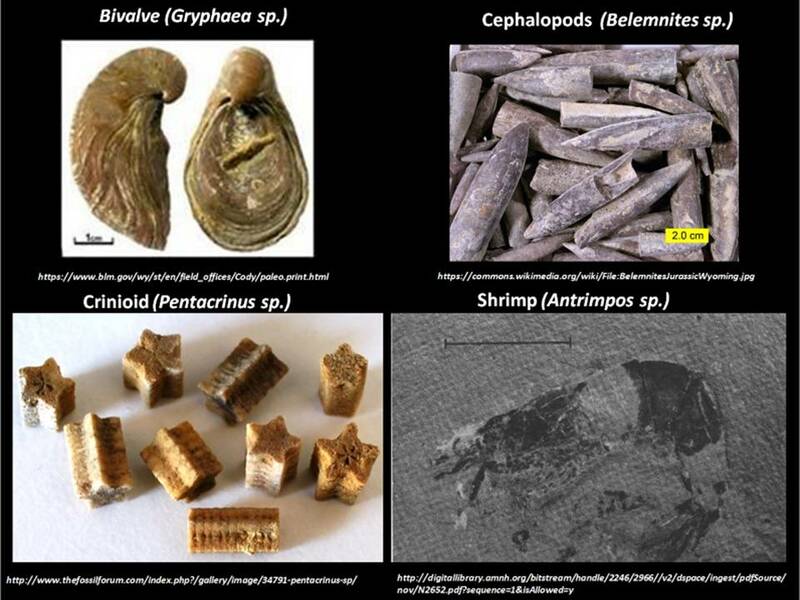 Large marine reptiles, Plesiosaurs and Ichthyosaurs, in turn, enjoyed the taste of Belemnites. Sharks were also partial to this Jurassic seafood delicacy. Pterosaurs soared in the Jurassic sky above the sea and strolled along beaches to rest and feed. Their fossilized footprints are preserved in Sundance sandstone at Alcova Reservoir of central Wyoming and the Bighorn Canyon National Recreation Area, in the northern Bighorn Basin. They also left tracks at the southern limit of the Sundance Sea in the laterally equivalent Summerville Formation of Utah and New Mexico. 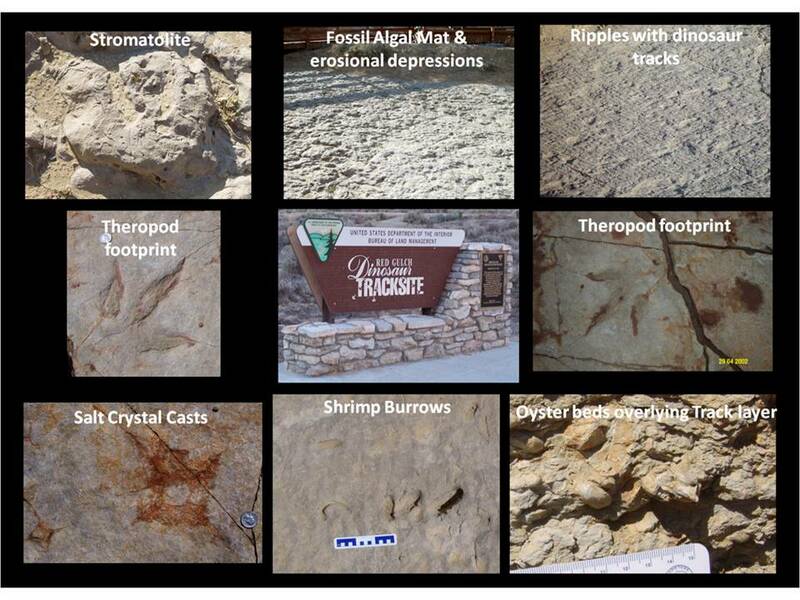 Mid-Jurassic terrestrial dinosaur tracks have been discovered at several locations in the northeastern Bighorn Basin. The tracksites record the footprints of small- to medium-size tridactyl reptiles as they roamed nearshore areas. Before discovery of the trackways, the areas were thought to be entirely submarine with no terrestrial exposure. 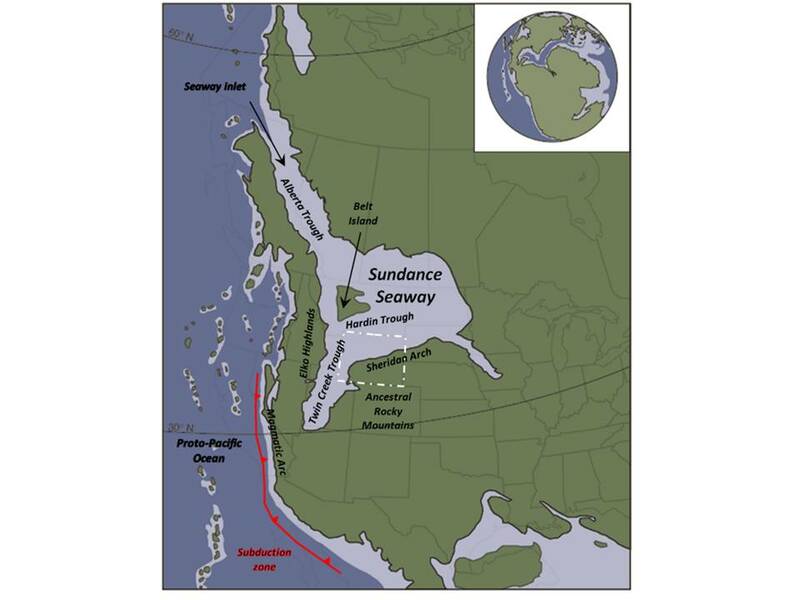 Their discovery led scientist to revise their understanding of the Sundance Sea paleogeography. Red Gulch Tracksite area near Shell is a great place to view tracks made by mid-Jurassic dinosaurs along the shoreline of the Sundance Seaway. Invertebrate fossils and sedimentary features of this period can also be seen. ​The “Jurassic Park” movie has given the wrong impression of dinosaurs in the Jurassic. The Tyrannosaurus Rex and Velociraptor “stars” of the movie did not exist in Jurassic time. They were creatures of the late Cretaceous Period. Invertebrates of the Jurassic Seaway. Upper Right: Belemnites – an extinct squid-like with a hard internal skeleton. Called “thunderstones” by Europeans who thought they were produced by lightning strikes. Vertebrates of the Jurassic Seaway. Vertebrates of the Jurassic Seaway sky. Tracks occur in the Sundance Formation in Wyoming and Montana, and in the age-equivalent Summerville Formation in Utah and Arizona. Left: Major Pterosaur tracksites of the Sundance Sea. After Reynolds, R.E. and Mickleson, D.L., 2006, New Mexico Museum of Natural History and Science Bulletin, Vol. 37, Fig. 1, p. 226. Greater Red Gulch Dinosaur Tracksite Area, northeastern Bighorn Basin. Tracksite locations shown by colored stars in lower right of image: Basal Lower Sundance Formation: Red: RGDT = Red Gulch Dinosaur Tracksite; Green: FRDT = Flitner Ranch Dinosaur Tracksite; Yellow: YBRDT = Yellow Brick Road Dinosaur Tracksite; Purple: SMDT = Sheep Mountain Dinosaur Tracksite; Middle Gypsum Spring Formation: Blue: GSDT = Gypsum Spring Dinosaur Tracksite. Google Earth Image. The footprints preserved at the Gypsum Spring Tracksite north of Shell are all developed within a four foot thick zone in the middle unit of the formation. They are about 170 million years old and may hold evidence of swimming terrestrial reptiles. The Red Gulch Tracksite is the largest known site in Wyoming and is dated at 167 million years ago. The tracks in this area occur at the top of the basal member of the Lower Sundance Formation (Canyon Springs Member). At all four Sundance tracksite locations, this is the unit just below the “J2B” erosion event and records a drop in sea level of the Sundance Sea. Several features indicate an intertidal to supratidal depositional environment: current ripples, fossilized algal mats (stromatolites), erosional depressions, shrimp burrows and salt crystal casts. The overlying Stockade Beaver Member records a sea level rise marked with an abundance of oyster shells (Gryphaea). ​The Red Gulch site gives visitors the opportunity to walk in the footsteps of creatures from the “Age of Reptiles.” Dinosaurs continued to evolve throughout the Mesozoic Era and grew much larger than these mid-Jurassic therapods. Yet they were all destined to disappear when the Chicxulub impactor crashed into the Yucatan. There was another small, insignificant life form that co-existed with dinosaurs. 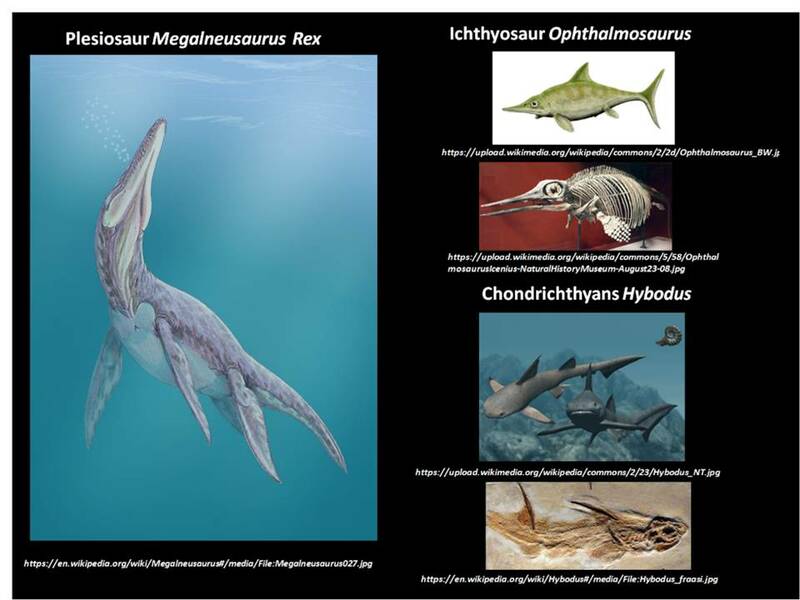 They experienced tremendous adaptive radiation in the mid-Jurassic. So as the reptiles swam, flew and walked about the Sundance Sea, mammals scurried around in the shadows awaiting their opportunity. Features at Red Gulch Tracksite. Wyoming is a land of relatively flat, high desert basins surrounded by rugged mountains. This arid landscape is largely the result of the third phase of tectonic evolution of western North America over the last 70 million years. The nearest ocean today is over 700 miles to the west. But for most of the earth’s history the area that would become Wyoming was submerged beneath marine waters. Precambrian (3.8 Ga-541 Ma) rocks contain stromatolites and banded iron formation that indicate anoxic, acidic seas where microbial mats thrived. After eons of photosynthesis, the mats changed the chemistry of the ocean and atmosphere allowing diverse life forms to flourish during the Phanerozoic (<541 Ma). During the first Phanerozoic phase of tectonic evolution (541-160 Ma) the seas flooded the Wyoming shelf from the western passive margin that was created with the breakup of the supercontinent Rodinia (750-700 Ma). The overwhelming majority of the rocks were marine carbonate deposits. Marine deposits also dominated the second phase of tectonic evolution (160-70 Ma), but the dominant lithology changed to clastic rocks. A continuous mountain chain, the Western Cordillera blocked ocean incursion from the west throughout Phase 2. Instead marine waters transgressed the continent from the Arctic Ocean in the north and the Gulf of Mexico from the south, forming the Cretaceous Western Interior Seaway. The earlier mid-Jurassic Sundance Seaway developed during the transition between Phase 1 and 2 of the Phanerozoic Eon. The Jurassic was a time of major reorganization for the earth's tectonic plates. The 100 million year old single world supercontinent Pangea began to break apart in the early Jurassic (about 180 Ma). The Atlantic Ocean began to rift open to define the eastern edge of North America. Rifting of the Gulf of Mexico initiated between North and South America. The subduction of the Farallon oceanic plate beneath the western edge of the continent generated a volcanic arc that created the Sierra Nevadas. Mountains began to rise in Nevada and Utah during the Elko Orogeny. Exotic terranes rafted onto and attached themselves to western North America. 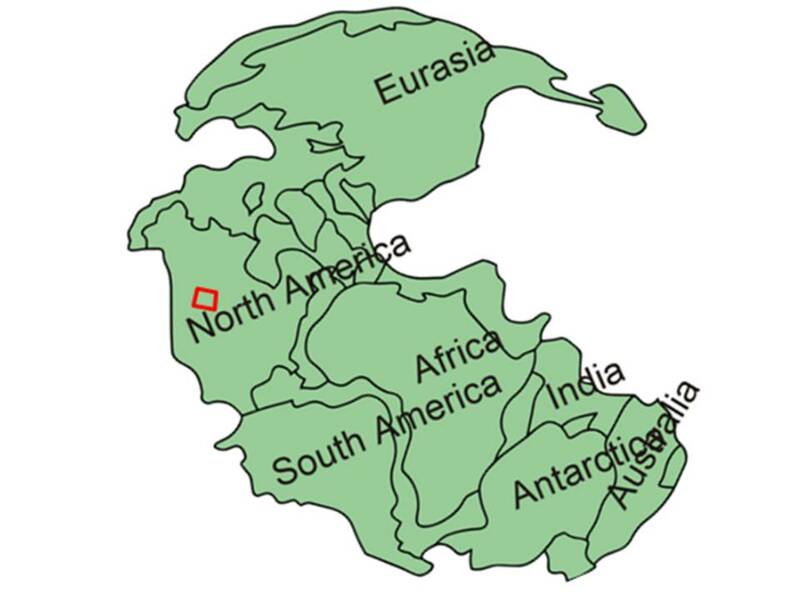 Reconstruction of the supercontinent Pangea. Red rectangle shows position of Wyoming. Paleogeographic reconstruction of western North America in the Bajocian Stage (~170 Ma), based on paleogeographic reconstructions of Blakey (2014). The Alberta and Twin Creek troughs were deeper water retroarc foreland basins east of the developing origin. Belt Island and the Sheridan Arch were persistent positive areas that influenced sedimentation. The sediments deposited in the Sundance Seaway record the repeated flooding and draining of the Wyoming-Montana shelf. Four or more major sea level rise cycles occurred during the mid-late Jurassic Period. They are separated by erosional events (J1 through J5) developed during sea level lowerings. Several smaller subcycles may occur within each cycle. The Gypsum Spring was deposited in a warm, shallow evaporite-carbonate ramp during the mid-late Bajocian Stage (170-168 Ma). 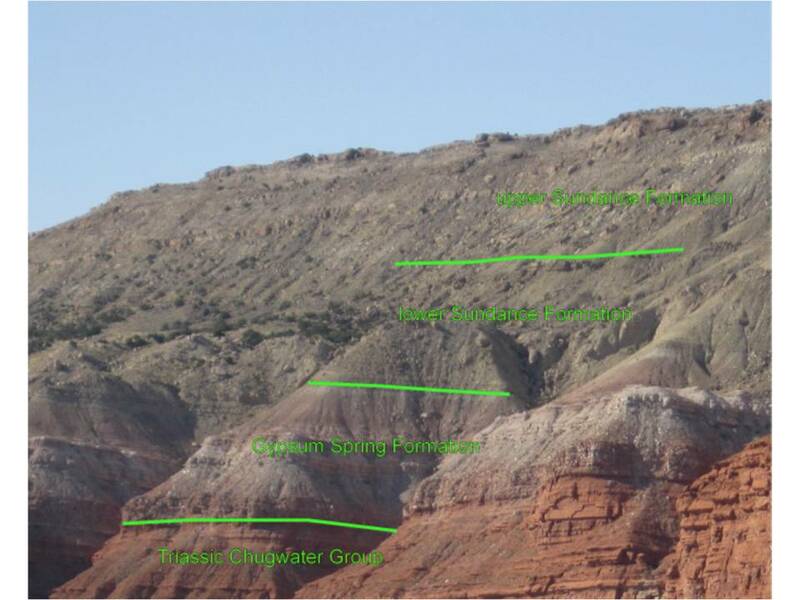 The unit is about 200-250 feet thick and consists of a basal member of white massive gypsum, a middle fossiliferous member of red claystone and siltstone beds with thin stringers of gypsum and carbonate, and an upper member of interbedded carbonate and red mudstone (aka Piper Formation). 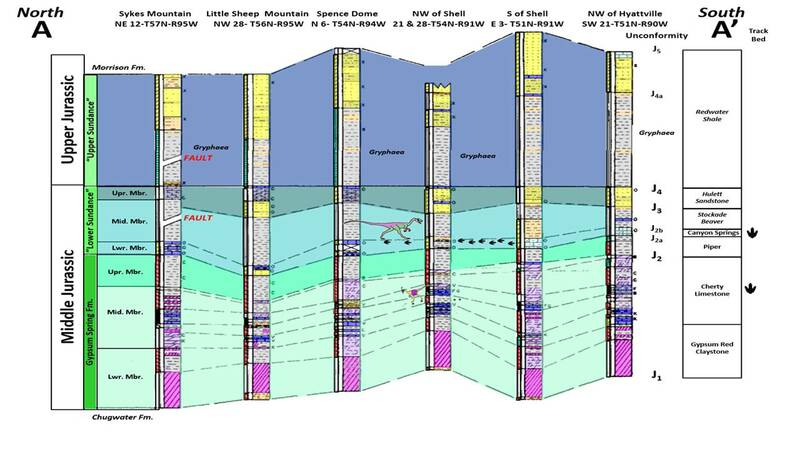 North to south outcrop cross section AA’ of the Sundance Seaway deposits in Big Horn County Wyoming. The Sundance Formation is informally separated into a carbonate dominated “Lower” and a clastic dominated “Upper” zones. Note the larger dinosaur symbol making all the footprints in the Canyon Springs Member. The Canyon Springs member is the track bed at all the sites except for the Gypsum Spring site north of Shell marked by the dinosaur with the swim suit. The shades of blue represent flooding cycles. Regional erosional events are labeled J1 through J5. Cross section & cross section legend: After Imlay, R.W., 1956, Marine Jurassic Exposed in Bighorn Basin, Pryor Mountains, and Northern Bighorn Mountains, Wyoming and Montana: AAPG Bulletin, Vol. 40, No. 4, Fig. 5, p. 569. Middle to Late Jurassic outcrop, eastern Bighorn Basin. 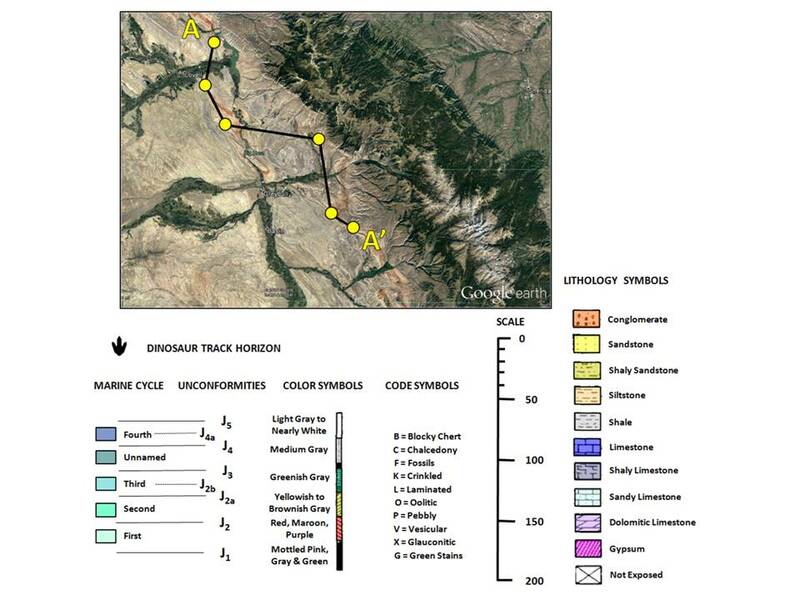 Subsurface Log: After Schmude, D.E., 2000, Interplay of Paleostructure, Sedimentation and Preservation of Middle Jurassic Rocks, Bighorn Basin, Wyoming: The Mountain Geologist, Vol. 37, No. 4, Fig. 2, p. 146. Outcrop: After Gilbert , C. and William Parcell Clark, 2011, Depositional Patterns and Stratigraphic Relationships in a Sag Basin: Middle Jurassic Gypsum Spring, Piper and Sundance Formations, NW Wyoming: Proceedings of the 7th Annual GRASP Symposium, Wichita State University, Fig. 2, p. 76. ​The tracksite is accessible with a passenger car in under 30 minutes from Greybull. However, the Red Gulch unpaved road is not recommended when wet because of messy, nasty bentonite clay. Starting at the only traffic light in downtown Greybull at the intersection of US 14 and US 16-20, head east on US 14 toward Shell and Burgess Junction, 0.2 miles Greybull Museum on right has an impressive giant ammonite that was found in the county (4 foot diameter, 960 lbs), 0.4 miles bridge over Bighorn River, 0.5 miles Greybull Oil Field on right that used an innovative oil mining operation where a long sloping tunnel was driven under the field with multiple holes drilled upward from the tunnel into the field for gravity oil drainage (it probably wins for most unusual way to develop an oil field!) this link has multiple pictures of the tunnel installation http://www.dsiunderground.com/projects/project-details/article/greybull-petroleum-usa.html, 6.8 miles old Shell schoolhouse on left, 7.3 miles Davis Road turnoff on left for Devil’s Kitchen (see Geowyo Devil's Kitchen page), 10.3 miles Beaver Creek Road turnoff on left (see Geowyo Shell Dinosaur Bone Beds page), 10.5 miles turn right on Red Gulch/Alkali Backcountry Byway, 11.0 miles sandstone outcrops on both sides of creek are Cretaceous Cloverly, 11.4 to 14.4 miles multicolored shales are Lower Cretaceous Cloverly and Jurassic Morrison Formation, the Byway travels along the crest of Cherry Anticline all the way to the tracksite, it is a fold that plunges to the northwest, note flat beds on crest of fold, beds to left dipping to northeast toward the mountains and beds on right dipping southwest toward the basin, there are a number of dry exploration wells drilled on this anticline, 15.7 miles turn right into Red Gulch Dinosaur Tracksite, 15.8 miles parking area with restroom, picnic tables, and grill.